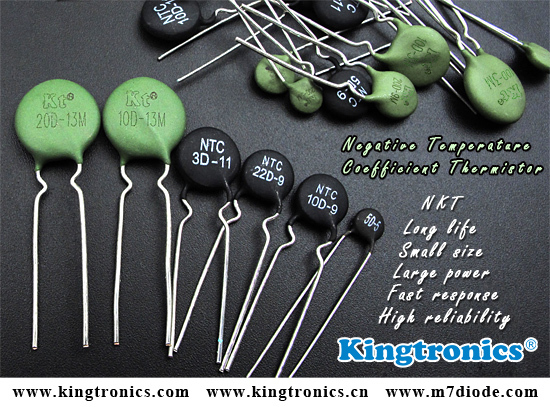 Kingtronics confidently recommends NKT negative temperature coefficient (NTC) thermistors to you. They are large power, strong capacity of suppression of inrush current and small residual resistance. Small size, long life, high reliability and fast response. The sizes from NKT D-05 to NKT D-20 are certificated by RoSH and REACH. Kingtronics NKT NCT thermistors are available in a range of types, straight lead, inside kink lead, front and rear kink lead depending on your choice. Kingtronics sells quality products around the world for many years, our rich professional experiences provide the technique guarantee, and you can rest assured to place an order with us!